I think DJQ should get more clearance for the amp, as it can get very hot after awhile. Funny couldn't see CD101 in plinius website anymore, discontinued? yupz long ago discontinued. replaced by Tiki, Toko and Mauri Cd player. even the Tautoro also not on website already. in the early years, there was lots of talks on the Plinius. only a handful with the Hiato and Hautonga clearly enjoyed the best of the integrated amps. although the inspire 880/980 helms a different target. it is still very much a good integrated amp for its size. i was lucky to get the last Tautoro pre amp. now got $$$$ also cannot get. 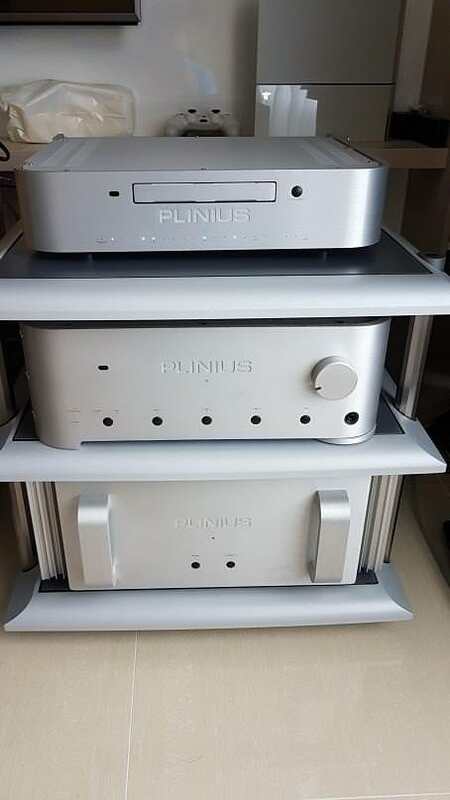 Plinius will tell you buy the new Reference M-10. Still enjoying my hiato not like I can upgrade anyway. Hi.DJQ. You shifted to Pounggol? the down side i realised is the TAOC rack seems much smaller as it barely fits souce pre power into a 3 tier rack alone... kind of makes me miss my much bigger FE Pagode Edition Racks. The TAOC rack is matching with your beautiful Plinius. yeah there isnt any within the Plinius lineup for intergrated amps. Took me really long to Upgrade the most impt aspect of Hifi setup, which is the room. now everything is in the living room. C1 breathes easy driven by SA103. now with Tautoro pre together with the basic CD101 which i secretly acquired. everything is sweet as i remembered them to be from my old place when i had the kaitaiki. now is to slowly tweak and start putting footers to improve it. Congratulation on your new upgrade, any home audit coming soon? Itch to listen to your C1. its been only 8mths... i am considering switching camp. upgrading bug. wonder where all the plinius owners went to? use to be so much well known. now used ones rare, contemplating whether to replace anot. What is the weakness of your hifi systems and why not consider get a good DAC? Which camp are u switching to ? good DAC is subjective. always a long debate on it. no , no weakness. really its very very good. decided not to sell CDP. to those who have pm me. sorry you all missed it. nothin beats the basic true blue redbook CD player. will be getting a entry DSD DAC for PC playback on DSD files.